New bright whites and a cage full of ice, and a naked little canopy to feed my disease. Kishi Bashi is the pseudonym of violinist/singer-songwriter/composer K Ishibashi (born November 4, 1975 in Seattle, Washington). He is a founding member of the synthpop group Jupiter One, and a touring member of Of Montreal and Regina Spektor. In 2011, he began recording and performing as a solo artist, and opened for Sondre Lerche and Of Montreal. His music is built on years of studying film scoring and orchestral composition, combined with influences of both current and past pop music. His debut solo EP, Room For Dream, was released on Aerobic International in May 2011. It features four songs, including a duet with Of Montreal's Kevin Barnes. Kishi Bashi is currently touring North America, and recording music for a full-length album. Kishi Bashi (whose real name is K Ishibashi) might not be a household name, but he is by no means a newcomer to the music industry. The singer-songwriter/violinist/composer is a founding member of the synth-pop group Jupiter One, a touring member of Of Montreal, Sondre Lerche, and Regina Spektor, and he's also been prolific as a session musician for studio recordings. But 2011 is his year to shine as a solo artist, with the release of his debut solo EP, Room For Dream. While on an extensive North American tour, we spoke with Kishi Bashi before his show in Nashville to find out the inspiration behind Room For Dream, how his daughter reacts to his music, and how Sondre Lerche taught him how to tweet. Band of the Day: Question: What do you think is the best way for someone to get into your music? What's the ideal listening situation? Kishi Bashi: My live show's really dynamic, so I would encourage people to come see me live. It’s really wild, pretty different than the recording. There’s a lot of looping, vocal looping, and it's just me. Band of the Day: Can you tell me about the concept behind Room For Dream, and the cover art? Kishi Bashi: “Room For Dream” is actually a joke! You know how at Starbucks they ask you, “Room for cream?” So one of my friends said, “Room for dream,” so I said maybe that should be the album title, and that’s how we came up with it! And my wife did the cover art. She likes to illustrate, and that’s a photo she illustrated over. Band of the Day: What made you decide to pursue working as a solo artist? Kishi Bashi: I have a new attitude about music--just make it and get it out there. I’m also in this band called Jupiter One, and in the course of five years we only had two albums. I wasn't making that much music, and only wrote like three songs on the newer one. But since I started touring with Regina Spektor, I had a lot of days off so I just took my laptop and started making a lot of music. And then playing with Of Montreal was really inspiring. Kevin Barnes, the singer, is really prolific; always creating and stimulating everyone. They have that kind of ethic. Band of the Day: And Kevin sings on your EP, on “Evalyn, Summer Has Arrived,” right? 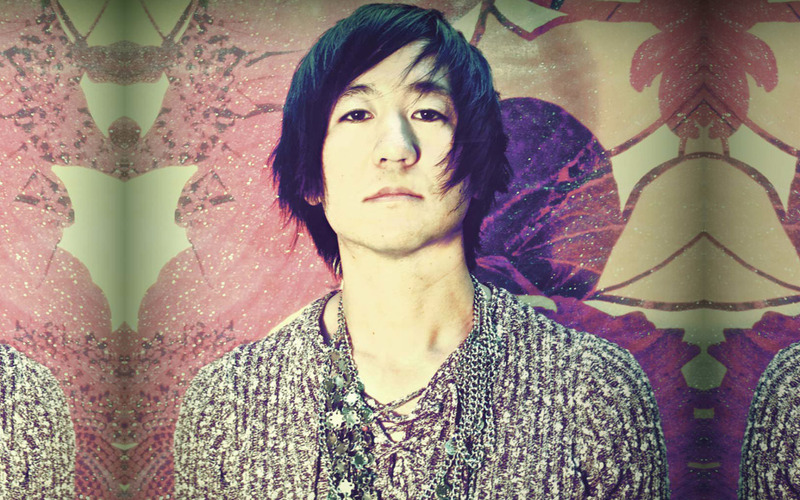 Kishi Bashi: Yeah, I've done a lot of string work for [Of Montreal] and so that was a good exchange! Band of the Day: You've also done a lot of work with [singer-songwriter] Sondre Lerche, and I saw on Twitter that he was giving you lessons on how to tweet? Kishi Bashi: (laughs) Did you see that? Yeah he’s a heavy tweeter! I’d see that when I was on tour with him, he was always tweeting! I don’t do that much, but now I'm really starting to get into it. Band of the Day: Is making music a full time thing for you or do you still have a day job? Kishi Bashi: Yeah, fortunately for me I just do music all the time! I do jingles and demos and stuff, some string arranging, and then I tour. And now I’m doing a lot of music I enjoy. Band of the Day: How does your daughter react to you being a musician? Do you make a point to do music education with her? Kishi Bashi: She's really talented, actually, and plays violin! She likes improvising, and my wife is also a violin teacher. Band of the Day: So you guys are completely a musical family! Kishi Bashi: Yeah, it equates to a lifetime of financial doom (laughs)! But we're all about taking risks to do what you love, and doing things that have a benefit to your soul. Band of the Day: And are your friends and family pretty supportive of that? Kishi Bashi: I'm really lucky to have extremely supportive parents. Even though I'm 35, and have a wife and kid, they don't give me a hard time about it. They're like, “press on!” I just make sure to keep them updated so that I don't seem like a bum (laughs)! I'm 35 and can only be touring for so long. I don't want to be doing that at 45! Band of the Day: Then where would you imagine yourself at 45, or 55? What's your own personal measure of success? Kishi Bashi: I would like to be headlining my own shows, be my own artist. When I get to a point where I can just do my music, I will be extremely happy. Right now I’m still doing a lot of people's music, and when I’m not doing jingles, and when I'm headlining my own shows, I’ll be pretty happy!